Bring water, milk and salt to a boil. Add oats and turn heat to medium low, stirring occasionally to prevent bubbling over and sticking. Cook for 4 or 5 minutes or until most of the liquid is absorbed and the oats are soft. 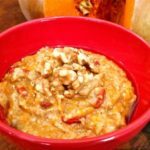 Stir in pumpkin puree, almond butter, vanilla, raisins or goji berries (if using), cinnamon and simmer on low, stirring occasionally for another couple of minutes. Remove from heat and stir in ground flax meal and maple syrup. Pour into serving bowl and top with chopped pecans.